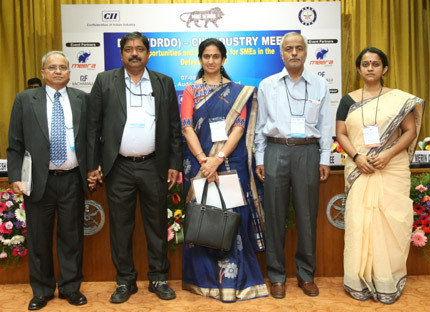 CII Telangana, in partnership with DRDL, are organising a two day conference on ‘Make in India: DRDL (DRDO) – CII Industry Meet on Opportunities and Challenges for SMEs in the Defence Sector at the DRDL campus, at DRDL Auditorium, Kanchanbag. the MSMEs and the defence organizations to collaborate in the areas of R&D, technology transfer and procurement. Dr. K Jayaraman, DS & Director, DRDL, in his keynote address, emphasised the need for a closer interaction and constant engagement between the defence organizations and the SME sector. He touched upon some of the ongoing DRDO’s Missile projects – Aakash, Ashtra, Brahmos, besides others and expressed the need to involve private sector, especially from the SME segment to develop various components, including critical engineering components and composite technologies. Dr. Jayaraman mentioned that the defence organizations have immense requirements in the areas of precision engineering, electronics manufacturing, electronics sub systems, RF Seeker technologies, besides many others and are looking for more SME players to cater the growing procurement needs. He also highlighted that defence components are getting exported, which goes to prove that the defence manufacturers from the private sector do meet the high quality standards in the international markets. Earlier, Ms. Vanitha Datla, Chairperson CII Telangana, in her welcome address opined that there is a growing imperative for Indian companies, especially SMEs, to integrate themselves into the supply chains of national defence majors in order to reduce dependence on foreign supplies and also to gain a foothold in the national defence market. “I am sure with the advancements in technologies, quality of domestic defence manufacturing has enhanced to global standards and the thought process of having more domestic players especially from the SME segment is indeed a welcome initiative” she said. In his theme address, Mr. Mahesh Desai, Convenor CII Telangana MSME Panel & MD & CEO, Meera & Ceiko Pumps P Ltd., highlighting the contribution made by the SMEs to the GDP of the country, urged the defence organizations like DRDO to mentor and enhance the potential of SMEs for indigenization production. “it can also broaden the defence R&D base of the country and use the policy changes to form joint ventures and public private partnership with SME players to meet their production targets and enable these industries to graduate to the next level”, he opined. Dr. P Bhattacharjee, Director – R&QA, DRDL delivered the concluding remarks. The conference was attended by around 200 industry members primarily from the SME sector and about 100 senior scientists from various projects of DRDO. The Conference had various presentations on the ongoing projects from DRDL, BDL, ASL, RCI, Tata Advanced Systems, besides others. It also had success stories of select SMEs doing business with DRDO.